While you can’t draw a straight line to climate change for every weather event, our future promises flashier storms with shorter bursts of greater precipitation. Infrastructure designed and built 30 to 100 or more years ago could not have predicted this new unpredictability, and we are starting to feel the impacts. There is a great need to build climate resilience into new infrastructure! We’ll need this not only to manage expected water levels beyond normal extremes (both higher highs and lower lows), but also in our stormwater and wastewater treatment facilities. To address the former, GBF commissioned an AECOM report entitled Providing Structural Solutions for Adaptive Management in the Great Lakes that continues to gain support from binational agencies and other stakeholders because it shows that we can mitigate these extremes. 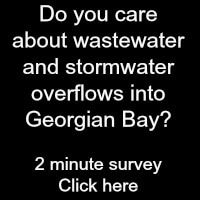 For the latter (wastewater facilities), GBF noted with concern this headline in the Midland Mirror “Excessive rain causing Midland to dump raw sewage into Georgian Bay”. The article mentions that over 1.3 million litres of raw sewage has ended up in Georgian Bay from the Town of Midland in the past four years. The Town of Midland can hardly be alone - in fact, the Great Lakes Commission noted at the end of September that US Great Lakes states would need $271 billion to improve public water systems. 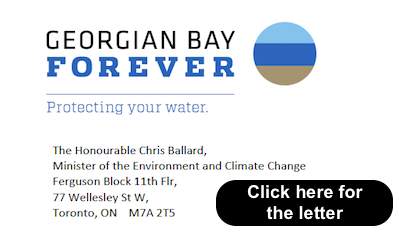 As for Ontario, at the moment GBF has signed this letter in support for Bill141, which aims to make public all sewer overflows. We feel public disclosure is important for Ontarians to truly understand the scale of this issue and the work needed to confront it. Please view the letter by clicking on this link, or the one above noted as a letter.